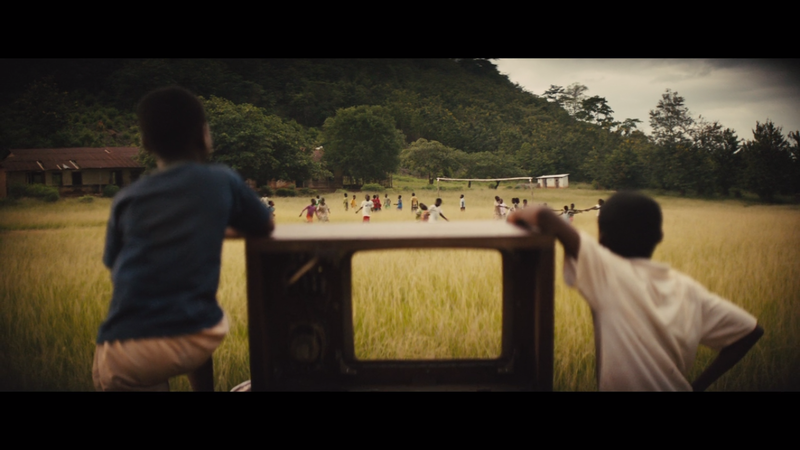 Cary Fukunaga’s Beasts of No Nation opens with Agu, a young boy, and his friends running around their West African village with a gutted old television. “Our country is at war and we are having no more school,” Agu explains, “so we are having to be finding ways to be keeping busy.” They run up to several adults, many of them Nigerian soldiers brought in to keep peace during the conflict, and attempt to sell their toy. The young boys use their imagination TV to present their exaggerated soap operas and kung fu movies. These children might be surrounded by war, but they haven’t personally experienced its horrors yet. Their game is full of the imagination and innocence we expect from young boys, qualities you would expect them to have for a long time. This is not the case in Beasts of No Nation. This is not the case for Agu. Oliver Stone’s 1986 film Platoon claimed the first casualty of war is innocence. This was certainly true for the 18-year-old American protagonist, who goes from the comfort of his own peaceful American suburban life to the reality of the Southeast Asian jungles. The film follows a man forced into an environment where he must mature to a level most of us never will. His family is safe at home, but he is not. As Americans we tend to think of war as something that happens ‘over there’ — some ambiguous moral dilemma that our tax dollars go to fight. Not since the Civil War have we had to worry about the fighting happening outside our door– a constant threat hanging over our heads. In Platoon an 18-year-old loses his innocence. 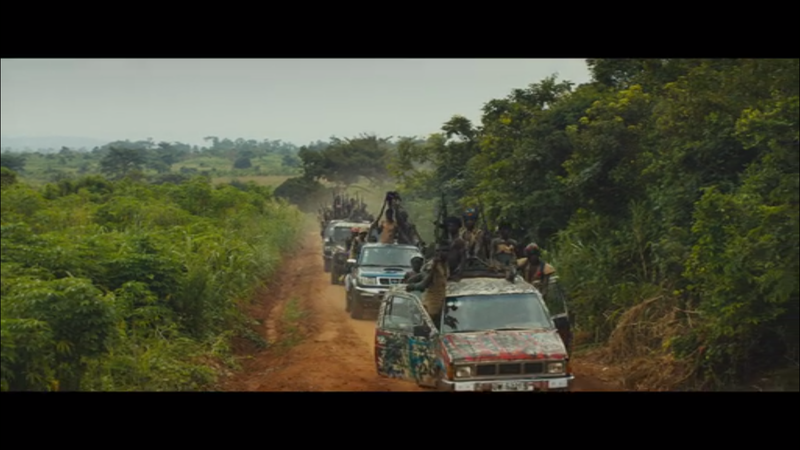 In Beasts of No Nation, Agu tries desperately to maintain a hold on his. The film, based on the novel of the same name by Uzodinma Iweala, is Netflix’s first foray into feature films. It follows a young boy, Agu, as he is thrust into the aimless wars of his unnamed West African country. After being separated from his mother and sisters, and later the deaths of his father and brother, Agu is taken in by the Native Defence Forces (NDF). A militia attempting a coup against the government, The NDF uses orphaned young boys as soldiers. Their Commandant, played by Idris Elba, use drugs and psychological manipulation to convince these young boys that he is their only family. Agu and the other boys are given machetes and machine guns, but retain their innocence and child-like qualities. Fukunaga, whose resume includes 2011’s Jane Eyre and HBO series True Detective, juxtaposes violent imagery of child soldiers riding in Toyota trucks with semi-automatic weapons pointed at the sky with the same young boys playing games in the West African bush. In another scene, young boys pretend to be the Commandant while other soldiers execute villagers. Fukunaga uses these scenes to remind the viewer that these are not soldiers, but children. Even with AK-47s in their hands, they are still children. The Commandant uses notions of family to manipulate these boys into following him. He often reminds them of what their life would be like without him and how much better their life is with him. “And you’re having any food that you want from chicken, cow, fruit and vegetable. Any kind of fish you want, we got.” He encourages drug use to weaken their resolve, turning them into heroin-dependent psychopaths. He needs to steal Agu’s innocence, whether through empty promises, drugs, or sexual abuse, to turn Agu into a mindless soldier dependent on his malicious, paternal leadership. I saw terrible things and I did terrible things. So if I am talking to you, it will make me sad… and it will make you, too, sad. In this life I just want to be happy in this life. If I am telling this to you, you will think that I am some sort of beast or devil. I am all of these things, but I am also having mother, father, brother and sister once. They loved me. The film ends with Agu standing on the shore, watching other boys playing in the ocean. He runs to join them, realizing some part of his innocence remains. He just needed to find his way to it once again.